There are a number of ways to determine or describe the density of activated carbon. The density of dry activated carbon is normally between 200 and 650 kg/m³. The density is very dependent on the raw material, the production process, the activation process (activation by steam of chemicals) and the activity of the final product. For example, wood based carbons have a lower density than coal based carbons. Real density - The real or true density is the density of the actual carbon skeleton excluding the porosity within the particles and the voids of the bed. Typical skeletal or real density is 2,150 to 2,200 kg/m³, close to the density of graphite. Particle density - Density of only the carbon particles, excluding the void volume between the particles but including all adsorption and transport pores. Typical particle density is 700 to 750 kg/m³. Wetted particle density - Density of only the carbon particles, excluding the void volume between the particles but including all pores filled up with water. Coal based activated carbons have a typical wetted particle density of 1,200 to 1,400 kg/m³, which is higher than the density of water. Apparent or vibrated density (DSTM 12 according to ASTM D 2854) – The density of a packed bed of carbon particles, filled in a standard cylinder vibrating the granules in a way to minimize voids between particles. It is a repeatable, quick and simple method to measure and is therefore an excellent quality control parameter. Typical apparent density (AD) values are between 250 to 650 kg/m³. Tamped or tapped density (DIN ISO 787-11) - The tamped density is equal to the ratio between the mass and the volume of a powder carbon after it has been tamped in the tapping volume meter under stipulated conditions. The bulk or shipping densities of powder carbon range from 80 to 100% of the apparent density. Backwashed and drained density - The density of an activated carbon bed that is backwashed segregated and drained. In drinking water, granular activated carbon beds are backwashed and segregated with up flow water through the carbon bed. Smaller particles are pushed to the top while large particles migrate to the bottom of the carbon bed thereby segregating the carbon particles. The backwashed and drained density (B&DD) is typically 85% of the apparent density and is used for adsorber sizing in drinking water applications. Densified density – The density of activated carbon obtained for a densified bed. 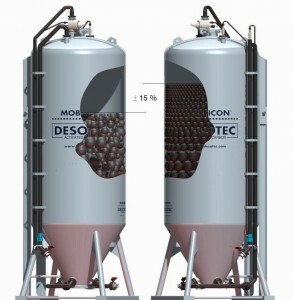 In gas storage applications the activated carbon is often densified to obtain more storage capacity in the same volume.